It’s a sad state of affairs when you find yourself hoping nationwide doubt surrounding the Cleveland Cavaliers could help fuel them to what looks like an impossible-to-win championship. However, that’s where I find myself today. Once again, the Cavs have made it to the NBA Finals. Once again, they have to play the Golden State Warriors. Once again, they’re overwhelming underdogs, to the point where you have to scour the web to find someone, anyone who thinks they have a real shot at winning. Obviously, this isn’t exactly what you’d call confidence-boosting for Cleveland fans. However, it also might not be a bad thing, at least not from the team’s perspective. I’m fully aware of why nobody in their right mind is betting on Cleveland. A better Cavs team was unable to beat this same Warriors squad more than once in last year’s Finals. Cleveland has gutted its way through a grueling postseason, twice being pushed to the brink of elimination. At times, LeBron James has looked so gassed from carrying the load someone sneezing nearby might be enough to tip him over. Meanwhile, the Warriors still boast two MVPs in their starting lineup, are a match-up nightmare and possess the ability to end any contest with just one offensive flurry. So, yeah, Cleveland’s odds are bad for a reason. An overwhelming majority feel as though this year’s Finals is nothing but a formality, that Golden State is OK to start planning the parade now. It may not be fun for the Cavs to hear, but it sure is something they can use to their advantage. This is a team which has spent most of the postseason proving doubters wrong. Cleveland was declared dead in the water as early as its first-round match-up with the Indiana Pacers. Many were reading the team’s eulogy when it was down 0-2 to the Boston Celtics last series. The fact the Cavs even made it this far is stunning when considering all the negativity they dealt with over the past two months. Likewise, how often have we been told James is out of gas through these playoffs? It seems like every Cavs defeat sparks numerous claims that their star player can no longer handle the load. Said losses are almost always followed by another Cleveland win thanks to another Herculean effort from James. This postseason has also featured the Cavs’ role players responding to a disparaging SNL skit by throttling the Toronto Raptors with one of the most balanced attacks we’ve seen from them all year. Knowing this, it at least gives me some hope. Cleveland players are essentially being told their presence in the Finals is just a waste of everyone’s time. The roster is being labeled as one of the worst James has ever been a part of. It’s tough to believe the entire team isn’t seeing this as motivation. Sure, the Warriors were favorites last year, too. At the same time, the predictions weren’t nearly this lopsided. The Cavs were defending champs, having just overcome a 3-1 Finals deficit the year before. They also barreled through the Eastern Conference playoffs, winning all but one game. Beating Golden State was still an uphill battle, but it didn’t seem as physically impossible as it does this year. My hope is this overwhelming skepticism surrounding Cleveland plays into how both teams approach this series. It wouldn’t be surprising if Golden State, knowing how easily it coasted through last year’s Finals and how much weaker its opponent’s roster is this time around, got overconfident and assumed another trophy was in the bag. Likewise, you’d like to think being told by everyone they shouldn’t even bother showing up will light a fire under the Cavs. At the end of the day, we’re talking about nothing more than a motivating factor, something which certainly won’t fully determine the result. 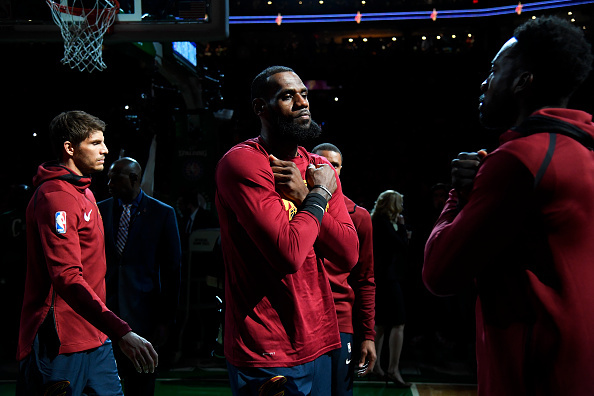 The Cavs may be incredibly driven by the entire country scoffing at their chances, but if role players continue to struggle, a Finals defeat is still inevitable. Still, almost all the coverage paints Cleveland as a team which literally has zero chance of beating the Warriors. Sometimes, the opportunity to prove people wrong is the only motivation needed. I hope that’s the case with the Cavs, at least.